In today’s technology driven world, you can no longer afford to manage a home remodeling company with paper and pen. Why blow your evenings banging out paperwork? Use the home remodeling software Smart Service to automate your administration and enjoy more time savings than you can imagine. Get back to bidding on jobs and focusing on the work itself. Worried adding software will add headaches to your process? Don’t be. 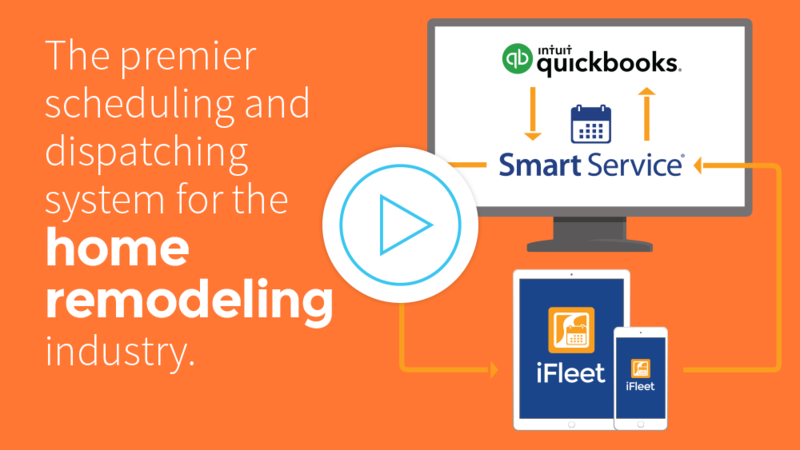 Smart Service functions as a direct add-on to QuickBooks. That means you can turn your current accounting software into home remodeling quoting and project management software without navigating a brutal learning curve. Simplify with Smart Service. Learn more. Home remodeling software from Smart Service makes every new project a breeze. Create your quote on your mobile device the first time you meet with your prospect. Schedule jobs on the intuitive scheduling board. Manage paperwork with the mobile app. Furnish invoices electronically, greatly reducing the billing cycle. Learn more. You won’t believe the difference mobile home remodeling software makes. Use smart phones and tablets to keep everyone in your company on the same page. Give each of your employees visibility on the work already performed on a particular project. Install a system that sends updates and completed paperwork between the office and field instantaneously. Put the tools you need to succeed in the palm of your hand. Learn more. Discover what business owners from all over think about Smart Service.